It’s interesting how another person’s black cloud can cloud your day. As I set out for a run over the lunch hour, another co-worker fired off a few derogatory comments about running. It was an attempt at humor but came out sarcastically and with derision. It was the kind of comment I’ve come to expect and can usually ignore. But the comment stuck with me. In fact, it wouldn’t let go. Even though I knew it wasn’t worth thinking about, it still stuck. I have been running for seven years and know the value of regular exercise so it shouldn’t have bothered me. Yet, it stuck. There was a black cloud following me. Metaphorically, I kept looking back at it as I ran. It was about half way through my darkened run that a young woman ran by me – pretty, mid-twenties, bouncy ponytail, white teeth, enormous smile. Her smile was so captivating that I couldn’t help but smile back. It was only as she ran past that I noticed she was limping. I glanced down to see the source of her limp. She had no left leg. 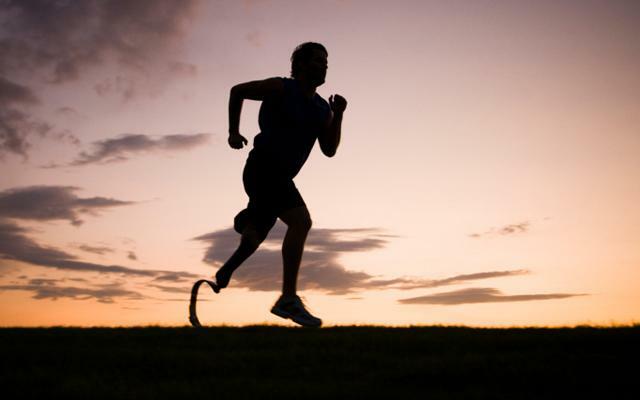 In her leg’s place was a running prosthesis. I ran another twenty feet and stopped, looking back. I watched as she struggled along. She may have been limping but she was out there, trudging around the Nike campus trail like the rest of us. Most likely, she was still giving that dynamic and inviting smile to every other passing runner. That little ray of sunshine vaporized my black cloud instantly. The rest of my run was under clear skies. I wanted to thank her but she was gone. It’s hard to see what’s in front of us if we’re always looking behind. Opportunities come from the front not from the back, so looking over our shoulder does little good. If you’re followed by a black cloud, stop looking back at it and look forward for a ray of sunshine in front of you. Today’s gift of time … As on most Thursday nights, took my son to his piano lesson, then stopped by to see the second half of my daughters’ drama performance. … Also, not a gift of time but contributed to our local classical radio station‘s fund raising drive (89.9). This entry was posted in Around the House and tagged black clouds, ray of sunshine. Bookmark the permalink. Such an inspiring message! Thank you Eric!